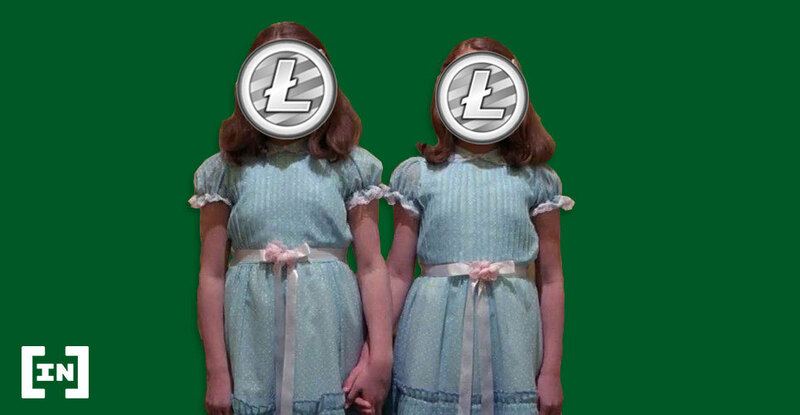 If you want to read a summary of our most recent Litecoin (LTC) price analysis and predictions but don’t want to waste time scrolling past the introduction, click here! Litecoin is the “digital silver” of cryptocurrency—or at least that’s what we’ve heard. It modeled after Bitcoin—”digital gold”—but with an amended Proof-of-Work consensus algorithm. In addition, the Litecoin Foundation has engaged in numerous partnerships and sponsorships to promote the cryptocurrency. Members have even discussed integrating the Mimblewimble Privacy protocol into the coin. This would cause massive differentiation from Bitcoin. What the future holds for Litecoin may not entirely be clear, but its price has been steadily increasing since Dec 2018. Will these gains hold or is a crash going to bring the price of Litecoin back to previous lows? In our previous Litecoin analysis, LTC/USD broke down from a symmetrical triangle. It is currently trading inside the descending wedge we have outlined below. Based on our analysis, we do not believe that the price will increase above the resistance area outlined above. On the contrary, the price is likely to keep decreasing and eventually reach the support area at $72. Litecoin (LTC) is a peer-to-peer digital currency and open-source software project which designed after Bitcoin (BTC).
. In fact, if bitcoin is ‘digital gold,’ Litecoin fashions itself as ‘digital silver’ — and largely piggybacks on everything Bitcoin does. This fact is both Litecoin’s greatest strength and its greatest weakness. Perhaps the biggest problem for Litecoin is the fact that Bitcoin still has a much larger market cap and price. Because Litecoin designed itself after Bitcoin, it will have difficulty competing unless it can successfully display differentiation. Furthermore, the differences offered must be desired by end users. Of course, Litecoin was never designed to compete with Bitcoin. Both coins can exist together. They may develop different uses and audiences. Both could be integrated into distinct industries or communities as currency while another is integrated into other industries and communities. The lower price tag of one litecoin versus one bitcoin is also somewhat enticing. For the price of one bitcoin, an individual could buy around 70-80 litecoins. In the long-term, should cryptocurrencies succeed to the point where it is legitimately difficult to get ahold of Bitcoins, Litecoin may see success in the retail sector as a more effective means of payment. In essence, Litecoin could become a more effective cryptocurrency than Bitcoin — but this is uncertain. On Nov 28, 2013, Litecoin reached a high of $55. A sharp decrease followed and led to new lows in mid-January 2015 of $1.10. Price rebounded. Within six months, highs of nearly $8.96 were reached. By early September, prices had dropped. For around two years, LTC traded between $3-$5 before rapid price spikes in late 2017 brought LTC to highs of over $370 in mid-December. Price has been on a downtrend since. LTC bottomed out on Dec 7, 2018 at $22.50. Dec 7, 2018-? $22.50 (Dec 7, 2019) $?.?? It appears as if we are in the midst of a third significant upward trend based on the significant price increases since the bottom on Dec 7, 2018. In this analysis, we will predict the date in which the price and date of the next peak. Furthermore, we will assess Litecoin’s potential price at the end of 2019 and 2020 respectively. To begin, we seek to isolate similarities between these upward trends within the technical indicators. To begin, we examine the similarly low relative strength index (RSI) ratings during each bottom. The lowest RSI recorded during the 2015 correction was 29. This occurred on the weekly candle for the week of Jan 12-Jan 19, 2015. The $1.10 bottom was also reached during this period. Similarly, an RSI of 29 was reached during the week of Dec 3-Dec 10, 2018. The $22.50 bottom was reached during this period as well. This may suggest that RSI may reach similarly low levels of under 30 shortly before LTC bottoms out after a longterm downtrend. Therefore, we may have the first similarity between the two bottoms: Oversold RSI values(<30) were reached on the weeks which correspond with the Jan 14, 2015 and Dec 7, 2018 bottoms. The price of LTC on Bitfinex is analyzed at three day-intervals from Jul 2017 to Mar 2019 (top chart) and from Aug 2013 to Jul 2015 (bottom chart). On Sep 15, 2017, the price reached a low of $32.40. After 61 days, the price reached a high of $370.70. A sharp decrease ensued, followed by a gradual downtrend ending with the Dec low at $22.50. The rate of decrease measuring from the $32.50 low to the $22.50 low is 32%. After the Dec high of $370.70, the price began to gradually decrease. On Jul 18, 2018, the price made a high of $94.40. It continued to create lower highs, alternating between gradual and sharp decreases. Several market cycles were completed, with each high being lower than the previous one. Tracing these highs gives us a descending resistance line (see the graph below). The resistance line was touched five times in total. Four times before the $22.50 bottom and once after. The second attempt after the bottom was successful, and the price has been increasing since. On Oct 22, 2013, a low of $1.61 was reached. After 42 days the price reached a high of $55. A sharp decrease followed almost immediately. This decelerated into an overall gradual downtrend that ended with a $1.10 low in January 2015. Similar to the 2018 correction, the rate of decrease measuring from the $1.61 low is 32%. After the Dec 2013 high of $55, the price began to gradually decrease. On May 25, 2014, it reached a high of $12. A downtrend followed with periods of both gradual and rapid losses. Several market cycles were completed, with each high being lower than the previous one. Tracing these highs gives us a descending resistance line (see graph below). The resistance line was touched five times in total. Four times before and once after the $1.1 bottom. The second attempt after the bottom was successful, and the price has been increasing since. The rates of decrease from the low point two months prior to the high are almost identical in both corrections. Both downtrends have followed very similar resistance lines. Despite these similarities, we are examining only two events to try to generate a pattern to predict future prices. This is an admittedly insufficient data set. For this reason, our price prediction is meant not only to gauge future price value. It is also meant to assess the validity of the patterns defined herein. If the prices we predict based on the patterns prove true, then the predictions themselves gain validity and may be useable in future analyses. The price made a high of $55 on Nov 28, 2013. Afterwards, a downtrend followed. It took 415 days for the price to reach the $1.10 low made on Jan 14, 2015. The price made a high of $370.70 on Dec 17, 2018. Similarly, a downtrend followed. It took 359 days for the price to reach the $22.50 low made on Dec 7, 2018. The price of LTC on Bitfinex is analyzed at weekly intervals from Jul 2013 to Mar 2019 alongside the 20 and 40-week (green & black) moving averages (MA). During the week of Jul 21-Jul 28, 2014, the 20-week MA crossed below the 40-week MA. This is known as a bearish cross and often indicates that a downtrend has begun. The $1.10 low was reached 175 days later. During the week of Jun 25-Jul 2, 2018, the 20-week moving average crossed below the 40-week MA. This is known as a bearish cross and often indicates that a downtrend has begun. The $22.50 low was reached 154 days later. The time it took to reach the bottom measuring from when a bearish cross occurred was 175 and 154 days in the 2014 and 2018 correction respectively. This gives us a rate of 1.136 (175/154). Therefore we are going to make the assumption that movements in the 2014 correction take 1.145 longer than the ones in the 2018 correction. The rate of 1.145 is created by calculating the average of the two rates we have found until now; 1.155 and 1.136. Since the bullish cross occurred 194 days after the $1.1 bottom, this pattern would gain more validity if a bullish cross were to occur 224 days (194*1.145) after the $22.5 bottom, on Jul 15, 2019. The price made a low of $1.1 on Jan 14, 2015. An upward move followed that took it to a high of $8.96 on Jul 10, 2015. Measuring from the $1.1 low, we get a rate of increase of 550%. When measuring the rate of increase, we are using opening and closing prices instead of the actual highs or lows reached during the day, in order to remove outliers which could skew the data in one or the other direction. Furthermore, wick highs and lows can differ from exchange to exchange. Therefore, the actual prices used to measure the rate of increase are $1.18 and $7.56. Similarly, the price made a low of $22.50 on Dec 17, 2018. Using the same rate of increase and the 1.145 time ratio, we predict that the price will be trading around $124 on May 11, 2019. In order to figure out the price at the end of 2019, will use the 1.145 rate and apply to the date in the 2014 correction which corresponds to Dec 31, 2019. On Dec 15, 2015, 333 days after the $1.1 low, the price closed at $3.7. Measuring from the $1.1 low, this is a 203% rate of increase. Therefore, we will use a 203% increase from the $22.5 low on Dec 17, 2018. This gives us a price of around $70 on Dec 31, 2019. To predict Litecoin’s price at the end of 2020However, we need to find the price at the end of 2020. In order to do that, we will use the 1.145 ratio to find the date in the 2014 correction which corresponds with Dec 31, 2020. On Oct 24, 2016, 656 days from the $1.10 low, the price closed at $3.88. Measuring from the low, this is a 224% rate of increase. Therefore, using the same rate of increase and measuring from the $22.5 low, we arrive at a price of around $76 on Dec 31, 2020. Period of time the swing low is reached after a bearish cross occurs. The price should reach a swing high of $124 on May 11, 2019. The price should be trading around $70 in December 2019. The price should be trading around $76 in December 2020. Is the altcoin rally bringing cryptos out of the 2018 bear market?